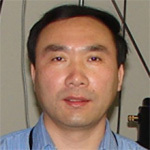 CDAC Research Scientist Zhenxian Liu, who manages the synchrotron infrared spectroscopy (FIS, Frontier Infrared Spectroscopy) beamline at NSLS-II, Brookhaven National Laboratory, has been appointed an Associate Research Professor at George Washington University. This appointment comes as the next five-year funding for the FIS facility from NSF-COMPRES formally moved to GWU beginning on June 1, 2017. FIS is supported jointly by the COMPRES award and CDAC. The FIS beamline is the only dedicated high-pressure synchrotron infrared spectroscopy facility in the world. Liu’s interests are in the physical and chemical properties and phase transitions of hydrous minerals, simple molecular systems and nanophase materials at high pressures and variable temperatures.